The Norway Pine was adopted as the state tree in 1953. The red or Norway pine (Pinus resinosa) became the official state tree in 1953. 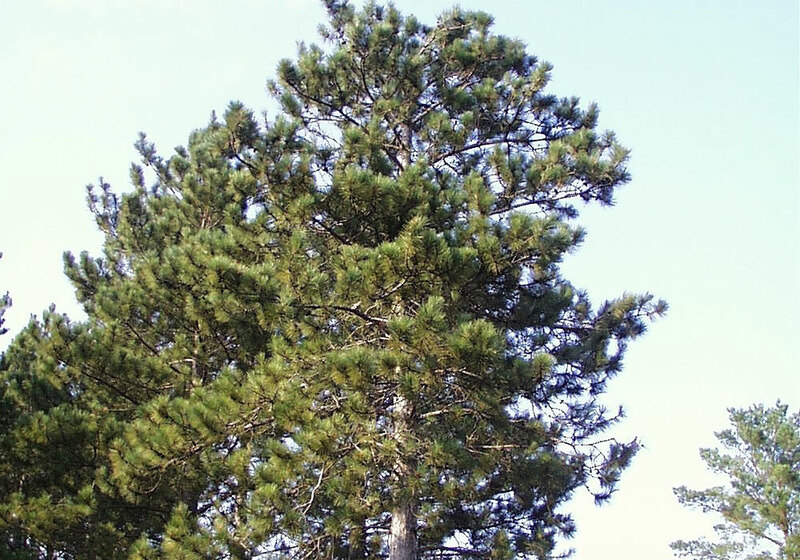 Red pines are tall, stately trees that reach heights of 60 to nearly 150 feet. Their trunks are straight and uniform and may grow to five feet in diameter. When mature, the trees usually are bare of branches for two-thirds of the way up the trunk, with rounded tops or “crowns.” Their needles are four to six inches long and grow in pairs. Red pines begin producing cones at 15 to 20 years of age. Their cones, about two inches long and stout, have a two-year growing cycle; they begin growing in mid-summer the first year, remain attached through the following summer, and ripen in the fall. Red pines are popular as Christmas trees when small, and when mature are harvested for use as structural timber and pulpwood; they also make suitable poles, pilings, mining timbers, and railroad ties because their wood is easily penetrated by preservatives. Red pines can live to be about 400 years old. They grow on outwash plains, level or gently rolling sand plains, and low ridges adjacent to lakes and swamps; in northeastern Minnesota, they often grow on very exposed sites including islands, peninsulas, lakeshores, and steep slopes.